The Bambino deserved better than this. From 1945 through 1948, there were three bombs of historic import. Harry Truman gave the order to drop the first two, Fat Man and Little Boy, on Japan; the third was dropped by Allied Artists Pictures. 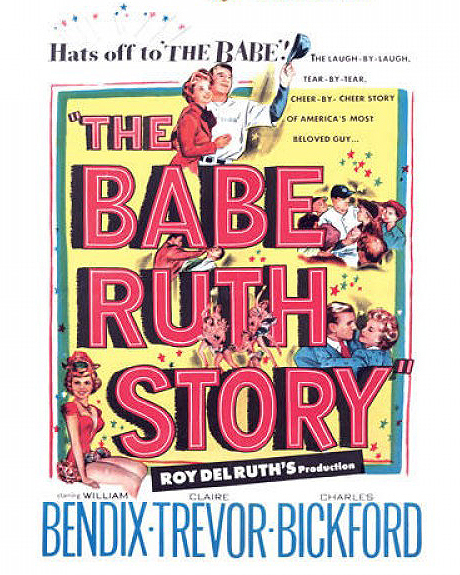 It was a motion picture known as The Babe Ruth Story. The fallout continues to this day. Now is a fitting time to take a closer look at this feature film, since the year 2014 marks the 100th anniversary of Babe Ruth’ major league debut. Not that the behemoth Bambino could ever disappear entirely from America’s national consciousness, but there has been a noticeable uptick in articles about the man and the legend this year. Casting an actor to play the title role in any biographical picture is a tricky proposition. This is magnified when the subject is a living legend, as was the case with Babe Ruth. Makeup and costuming help to some degree, but a character who was bigger than life with gargantuan appetites demands an actor cut from the same cloth. The topic of a Babe Ruth biopic was first broached in August 1941. World War II likely put that project on the back burner, as the studios were drafted to churn out features, shorts and documentaries as part of the war effort. In the early going, Orson Welles was one of the names supposedly in the running to play the Babe. Too bad nothing came of that, as Citizen Welles playing Citizen Ruth is an intriguing match-up. Welles’ baseball skills were likely lacking, but he would have been superb in the overeating scenes. At any rate, by 1948, he was no longer Hollywood’s golden boy, and he was too busy making Macbeth anyway. Complicating the casting process in 1948 was the intent of Allied Artists to get the movie into theaters while the Babe was still alive. By contrast, when MGM released its Lou Gehrig biopic, Pride of the Yankees, in 1942, Lou Gehrig had been dead for more than a year. Producer Samuel Goldwyn could take his time with casting, principal photography, and post-production. As a result, the Iron Horse was portrayed by a real movie star, albeit one more familiar with flesh-and-blood horses: Gary Cooper, who was to movies what Gehrig was to baseball, in spirit if not physique. Pride of the Yankees was an inspiring film about an expiring baseball hero. The same could be said of The Babe Ruth Story. The difference is in what each film inspires. In the case of the latter, it is mostly laughter. 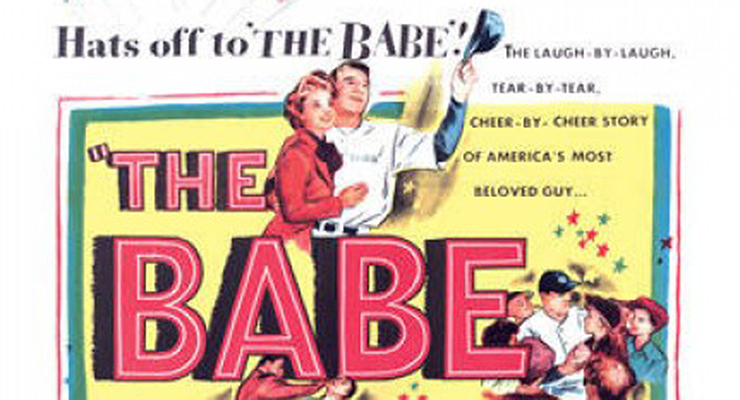 But the demise of the Babe was no laughing matter, and it was ongoing while the film was in production. On June 13, 1948, the Yankees celebrated the 25th anniversary of Yankee Stadium by retiring Ruth’s No. 3. It was the last time the Babe would appear at the stadium, and it was obvious to all present that the Babe was on his last legs. No time to wait for the best available choice to portray him, so what to do? Hey, William Bendix is available! William Bendix? Seriously? William Bendix is hardly a household word today, but he was a fairly familiar face in the 1940s and 1950s. If you needed someone to play a New York cab driver, a plug-ugly thug/lug/mug, or a stocky GI with a Brooklyn accent, he was perfect (in 1942 he received an Oscar nomination for Best Supporting Actor in Wake Island). He could even handle more challenging parts, such as an amnesiac war vet in The Blue Dahlia with Alan Ladd and Veronica Lake. He was not out of place in the supporting cast of prestige pictures handled by A-list directors (e.g., Alfred Hitchcock’s Lifeboat and George Stevens’ Woman of the Year – scripted by Ring Lardner Jr., by the way). Though he appeared in more than 50 movies, he is best known for a 1950s TV series called The Life of Riley, in which he played a blue-collar everyman whose schemes, grandiose or petty, inevitably ended in failure. His signature line was “What a revolting development this is.” Movie critics more or less said the same thing about his starring role in The Babe Ruth Story. So why was he cast? Paul Douglas (catcher Monk Lanigan in It Happens Every Spring, and the Pirates manager in Angels in the Outfield) was mentioned as a possibility, and Ruth’s wife Claire thought he would have been a good choice. Reportedly, Ruth himself was in favor of Bendix. It was not so much professional preference as personal, as William Bendix not only knew the Babe, he had worked with him! As a teenager, Bendix worked at the Polo Grounds when it was home to both the Giants and the Yankees. Bendix claimed he had seen Ruth hit more than 100 home runs, and given the dimensions of the Polo Grounds, the Bambino’s home run totals from 1920 through 1922 (148), and whatever stray home runs Bendix might have seen before or after that period, the assertion is likely no exaggeration. Bendix had also witnessed the Babe’s feats of gluttony, since his duties included being a gofer (today we might say an “enabler”) when the Babe got hunger pangs. All of the above might have given Bendix some insight into portraying the Babe, but it doesn’t mean he was the ideal candidate to play him. Bendix would have been fine as an umpire (which he did portray in Kill the Umpire two years later), a third-string catcher, a trainer, a newspaper photographer, a beer vendor…but not the Babe. Despite efforts to bulk him up and broaden his nose, Bendix in uniform resembles not so much Babe Ruth as Yogi Berra. I wonder if any Yankee fans picked up on that in 1948, when Yogi was in his third season with the team. Since the Babe was a man of extremes in all areas of his life, it’s only fitting that the same would be true of a movie made of his life. Unfortunately, the result was not extremely good, but the exact opposite. Now there have been many baseball films over the years. Some were good, some not so good. But there is something of a consensus about the worst baseball movie ever made. The Babe Ruth Story, which premiered at the Astor Theater in New York on July 26, 1948 (just three weeks before the Babe’s death), is the most frequently mentioned title. The film was described by one web critic as “The Plan 9 From Outer Space of baseball biopics,” but I’m not sure the comparison is apt. For the uninitiated, Plan 9 From Outer Space has achieved wide currency as the worst movie ever made. This 1956 opus (“Aliens resurrecting the dead! Flying saucers over Hollywood!”) from legendary poverty row film-maker Ed Wood was doomed from the start. With no money, lousy special effects (wobbling hubcaps as flying saucers), and the death of Bela Lugosi midway through filming, it could hardly have been otherwise. Over time, Ed Wood became a posthumous brand name, the low-budget, schlock counterpart of, say, Alfred Hitchcock or Cecil B. DeMille. What makes The Babe Ruth Story different is that it was not a low-budget movie from a studio on a shoestring. It was a perfectly respectable film from a perfectly respectable studio, albeit one with B-movie roots (in Monogram Pictures). The producer/director, Roy Del Ruth, had been making feature films since the silent era. He was a real pro with a star on the Hollywood Walk of Fame to prove it. He did some amusing tough guy movies with James Cagney in the early 1930s and later got into musicals, but if you looked at all of his films from 1925 to 1948, you might be hard-pressed to find one you’d actually seen, or having seen it, found it memorable. Allied Artists was not a conventional bricks-and-mortar studio with contract actors and directors. It could have leased any contract director from another studio or offered the job to any free-lance director, but perhaps Allied just liked the connection between Del Ruth and Babe Ruth. Admittedly, that makes about as much sense as asking Dr. Ruth to direct John Goodman as The Babe in that 1992 movie. Come to think of it, considering the Babe’s legendary libido, that might not have been a bad choice. Despite the debacle of The Babe Ruth Story, Roy Del Ruth’s career kept chugging along for the next few years. It looked like he had retired after 1953, when he made Three Sailors and A Girl, which sounds like a smoker but was a bona fide feature film, but six years later, he was tempted out of retirement to direct The Alligator People. Apparently rejuvenated by this reptilian opus, he was inspired to do one more movie called Why Must I Die? The question was not rhetorical. Less than a year later, Del Ruth was dead. Now that’s an exit strategy! I’m sure Del Ruth had his share of regrets at the end, but the casting of Bendix as Babe Ruth might have been the biggest. Del Ruth’s secondary casting, however, was superb, including a number of supporting players at the peak of their powers in 1948. Claire Trevor, who plays the Babe’s wife Claire (in this film his estranged first wife, who died in a house fire, is conveniently absent), also appeared in Key Largo in 1948 and won an Oscar for Best Supporting Actress. The same year, Charles Bickford, who plays Brother Matthias, the youthful Babe’s Baltimore mentor, was nominated for Best Supporting Actor in Johnny Belinda. Sam Levene, who plays Phil Conrad, a sportswriter who conveniently serves as the Babe’s confidante (possibly based on Ford Frick), was a longtime character actor, a familiar face in a number of late 1940s crime movies (The Killers, Brute Force, Crossfire) that have come to be regarded as classic examples of film noir. William Frawley, today best known for his continuing role of Fred Mertz on I Love Lucy, played Jack Dunn, Babe’s manager during his stint with the minor league Orioles. Frawley had appeared in more than 100 films. All of these people were real pros, but The Babe Ruth Story is not an ensemble film, so their skills only go so far. In a biopic, there’s no getting around a miscast title role. Even so, it’s not fair to pile on Bendix. He might have suspected he was not up to it, but how could he refuse such a plum role? Would any other supporting actor have turned down a chance to see his name above the title? The screenwriters, however, are fair game. Poetic license is one thing; a lousy script is another. The screenwriting duties were given to George Callahan, a B-movie veteran, and Bob Considine, who was primarily a newspaperman and not a screenwriter. (One source asserts that sportswriter Grantland Rice, a big Ruth advocate, also had a hand in the script.) Since Considine was not familiar with screenwriting, I suspect Callahan was brought in to work with Considine on form more than content. Since Considine (like Ford Frick) worked for the Hearst newspapers, that would have made him suspect in some circles. He had already done an authorized biography (also known as The Babe Ruth Story) of the Babe, published in book form as well as serial form in The Saturday Evening Post, so he was not only well acquainted with the raw material – he was responsible for it. Right from the start of the film, the viewer’s cornpone detector might start to twitch, as “Take Me Out to the Ball Game” wells up on the soundtrack over a shot of the House That Ruth Built, immediately followed by a group of Norman Rockwellish schoolboys paying a visit to Cooperstown. In highly dramatic, bordering on melodramatic, tones, the narrator (Knox Manning) praises a number of Hall of Fame players as their plaques are shown. He sounds as though he’s on a mission to convince the audience that baseball is the greatest game ever invented and George Herman Ruth was the greatest game’s greatest player! In-between, the script does follow the basic thread of the Babe’s life, from impoverished upbringing in his father’s waterfront saloon to St. Mary’s Industrial School (not a reform school, as the dialogue points out), to the minor league Orioles, then on to the Red Sox, Yankees and Braves, and finally to a disappointing retirement and fatal illness. That might sound maudlin enough, but we also get to witness the death of Yankees manager Miller Huggins, who is shown expiring just before Ruth and his new bride show up at his hospital room after the 1927 season. Actually, Ruth and Claire Hodgson did not tie the knot till April 1929, and Miller Huggins died at the conclusion of the 1929 season. Jumbled chronology is not unusual in biopics and need not hurt the narrative or the spirit of the film. Rumor has it that leaving out Ruth’s first wife, Helen, was at the request of second wife Claire. Or it might have been due to the fact that Ruth had a life that was too eventful for one feature-length movie and something had to go to minimize clutter. Or the separation of Babe and his first wife might have brought in the Babe’s numerous infidelities, and those would be difficult to integrate into a hagiography. According to the film, the Babe met Claire Hodgson while he was still pitching for the Red Sox; in fact, the two did not meet till 1923 when Ruth was in his fourth year with the Yankees. As portrayed in the film, the initial meeting occurs in a tavern where the Babe is pondering his sudden inability to get batters out. Claire, who has just seen him pitch, intervenes and tells him he is tipping his curveball by sticking out his tongue when he goes into his windup. Problem solved! As absurd as this might sound, it is actually a perfect example of how screenwriters fuse fact and fiction. According to Robert Creamer’s 1974 biography (Babe: the Legend Comes to Life), Ruth was tipping his pitches with his tongue, but it was pointed out to him not by his future wife, but by teammate Harry Hooper and manager Bill Carrigan. Thus the screenwriters handled the obligatory boy-meets-girl scene. Unfortunately, Babe immediately loses her, but later he finds her at a local cabaret (in real life, she was indeed a showgirl) where he inadvertently injects himself into a production of “Singin’ in the Rain,” soft shoe and all. I’ve got to believe this scene is pure fabrication. The same is probably true of the scene in which the Babe pops the question by scribbling it on his 60th home run ball and sending it to Claire along with an engagement ring. In the Babe’s last notable game (May 25, 1935) he is shown hitting three homers for the Braves at Forbes Field, which is certainly true (the Braves, however, lost the game by a score of 11-7). In the locker room afterwards, he announces his retirement, whereas in real life he did not do so till a few days later. Fulfilling a promise he had made to Braves management, he finished up the road trip with the Braves and played his last game on May 30 at Philadelphia’s Baker Bowl, where he played his first World Series game in 1915. In all of Bendix’s baseball scenes, the ones with the Braves ring the truest, perhaps because Bendix was 42 years old at the time, just one or two years (there was some dispute as to the year of Babe’s birth) older than the Babe was in 1935. That’s a pretty good line, but it sounds too much like screenplayspeak. Another memorable but questionable scene deserves special mention. While the Babe is at St. Mary’s, he is shown breaking a window with an errant pitch – on Christmas Day! When he comes inside to apologize to Brother Matthias, he meets Jack Dunn, the Orioles manager, and gives him a demonstration of his pitching prowess. In an astonishing display of control, he winds up and throws the ball right through the same jagged opening in the window without disturbing the tiniest sliver! In all his action sequences, Bendix is understandably awkward, as he was not a left-handed thrower or batter and coaching can only help so much – especially at his age. In Pride of the Yankees, the solution to this problem was to flip the film so Gary Cooper, batting right-handed and running towards third base, appeared to be batting left-handed and running towards first base. No laying on of hands for the Babe – just two or three words in passing will do. Thus sayeth the Book of Ruth according to the scribes Callahan and Considine. The Christ-like aspect of Ruth had never occurred to me – but maybe it should have! After all, in the New Testament, three wise men made pilgrimages to Bethlehem to worship the Babe…and in the junior circuit, Yankee fans made pilgrimages to the Bronx for the same reason. I’ll say he is, laddy boy! But the Babe, whose mission of mercy rendered him AWOL for the game, gets in Dutch with manager Huggins and gets hit with a $5,000 fine and a suspension – which actually happened, sans dog, on Aug. 29, 1925 in St. Louis. Then there is Ruth’s legendary called shot in Chicago during the 1932 World Series, which is fused with the Babe’s promise to hit a homer for a sick boy named Johnny six years before. As the film has it, the Babe goes to visit a sick boy named Johnny in Gary, Ind., before the game. The boy remains somewhere between listless and comatose, even after being presented with the autographed ball his doctor had requested. Not to worry, as the Babe promises he will hit one over the center field fence at Wrigley Field that afternoon. Comes the game, and as the Babe steps into the batter’s box, Claire Ruth shouts “Don’t forget Johnny!” above the din of the rowdy Cubs fans. Forget? The Babe? Au contraire, Claire! The Babe never forgets a sick child! Well, we all know what the Babe did (in the film, it looks as though Bendix swings at a pitch high and outside). Pitcher Charlie Root, who served up the historic homer, was offered a chance to play himself and re-create the scene, but he declined, insisting that Ruth had never called his shot, and he did not wish to take part in promoting such a falsehood. Root, by the way, said the pitch was low and outside. Whether the shot was called or not, after Johnny hears about it on the radio, a smile blossoms on his face and his eyes glow like one of those kids in Village of the Damned. Like radio preachers of old, the Babe can heal through the airwaves! Forget the March of Dimes, just set those crippled kids in front of the radio and twirl that dial till you find the Yankees game! Unfortunately, self-healing was not in the Babe’s repertoire. According to Robert Creamer’s biography, the Babe actually left his sickbed (he had been given the Last Rites at Memorial Hospital, now better known as Memorial Sloan Kettering Cancer Center, on July 21) for the premiere of the movie… but he left before it was over. I’m pretty sure he wasn’t the only one. A blowout does tend to empty the seats. Since the premiere was a benefit for the Babe Ruth Foundation, he must have felt his presence was required. The film shows Babe volunteering for an untested serum. In fact, his hospital stay did include some experimental treatment, initially with encouraging results, but the Babe was dead before his movie went into general release on Sept. 9. Some time during those final days, he might have harkened back to his own cinematic efforts in which he played fictionalized versions of himself (Headin’ Home in 1920 or Babe Goes Home in 1927) or Pride of the Yankees, when he did play himself. Surely, he couldn’t help but compare his biopic to Gehrig’s and wonder how there could have been such a discrepancy in quality. About all the two films had in common was that Mark Koenig portrayed himself in both. As is often the case in baseball films, a number of other people played themselves. In addition to Koenig, the cast included Bucky Harris (who was the Yankees manager in 1948), umpire Ziggy Sears and announcers H.V. Kaltenborn, Harry Wismer and Mel Allen. Curiously, Wismer was known for football broadcasts, and Allen, who is shown behind the mike for the Babe’s 60th home run in 1927, did not start broadcasting Yankees games till 1939. He was only 14 years old in 1927! On the other hand, it appears as though care was taken to use season-appropriate uniforms. The uniforms on screen match up pretty well with what I’ve seen in still photos. And some of those uniforms were filled with real ballplayers, including college ballplayers as extras. Behind the scenes, Lew Fonseca is credited for “Special Baseball Assistance,” whatever that means. Pat Flaherty, a career minor leaguer (he had yielded a couple of home runs to Ruth in an exhibition game) who somehow became Hollywood’s go-to guy every time a production involved baseball, is not only the Technical Adviser but also played Red Sox manager Bill Carrigan. Establishing shots of major league ballparks are employed throughout, and a number of stock shots (not always from the same ballpark) are intertwined. Yankee Stadium was put to good use, particularly in a couple of panoramic shots, including one of Bendix rounding the bases. Reportedly, Bendix actually hit one out to right field. This might sound like PR puffery, but considering the short porch at old Yankee Stadium, it is a distinct possibility. Unfortunately, filming at Yankee Stadium in 1948 makes anachronisms inevitable, notably the Ballantine Beer sign shown during a 1927 game when Prohibition was still in effect. As is generally the case with sports movies, game action shots are carefully framed to minimize the number of spectators shown. Those background extras do cost money. As is sometimes the case with old movies, some lines of dialogue often resonate to a different frequency with the passing of time. Hollywood studios were notorious for genuflecting to the Catholic Church, but today it is almost laughable when the Babe declines to sue Major League Baseball, exclaiming, “No, kid, that would be like suing the church!” Of course, today suing the church is common, now that people realize that not all priests are as benign as Brother Matthias. The Bambino deserves better, you say? Hell, a utility infielder for the Lansing Lugnuts deserves better. Baseball fans can argue from now till doomsday about the greatest third baseman ever, the best power hitter, the greatest reliever, or whatever. But as for the worst baseball movie ever? No debating society would waste its time on that topic. Good heavens, this movie sounds like a hot, sticky mess. I almost have to see it now. If nothing else, gotta see that scene with Pee-Wee’s miraculous recovery at the human hospital. Still chuckling at the description of that one. Glad I Wiki’d rather than rented. Sounds like a Depression era chick flick. Your girl drags you there figuring you’ll like it because of the baseball in it, you sit there for 2 hours nodding and smiling any time you sense her glancing at you, otherwise ruminate on the things you do for lust-, I mean, love. Well, it was well after the Depression so you can’t blame it on that! It’s still not as bad as the scene in the Goodman version where he hits a popup in the infield so high that he runs around the bases and scores before the ball lands! God that was awful! Regarding the pinch runner for Ruth’s home runs. My understanding is that during this era that pinch runners, I think also called courtesy runners, were allowed to be used under certain circumstances, I think even without being counted as a use (so the pinch runner could be used again). 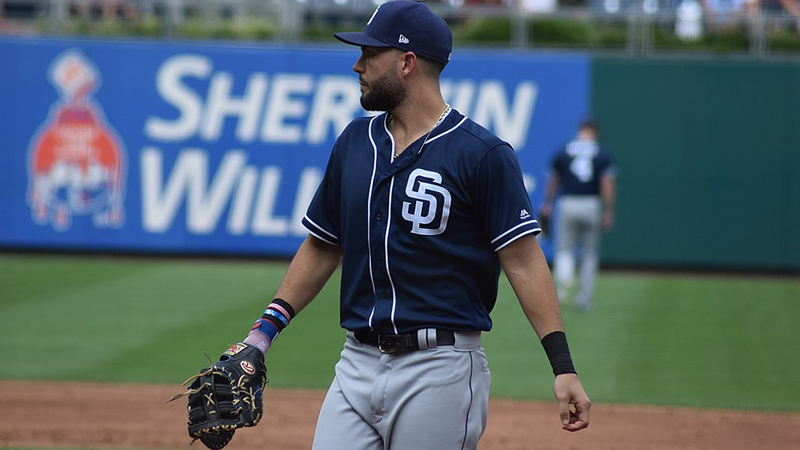 So actually, I think the pinch runners actually lend authenticity to the movie, though I don’t know if the Pirates really excused him from jogging out his HRs. There were courtesy runners then but only to replace a runner on base who was injured. The opposing team manager had to give permission for a courtesy runner to be used and he also had to approve of the runner, usually the slowest runner on the team. Otherwise runners would fake injuries so that they could be replaced by faster runners. Let’s just say that William Bendix came across more like Chester A. Riley than Ruth. That John Goodman movie of the Babe was just as bad. Would you please direct me to a resource that documents which 1977 World Series games were night games?